A half-marathon will be held in Haverhill for the first time, with a 10k run on the same day to raise money for St Nicholas Hospice Care. The events will be on May 11, starting and ending at the recreation ground, in what will hopefully become an annual event for the town. The event organiser is hoping you will get involved as a runner, volunteer or just cheering runners along on the day. HaverHalf and Haver10 have been made possible thanks to funding from Sanofi, and also from all three of Haverhill’s Suffolk county councillors. Stylize Display Graphics, Greenair Cars and Perform Sports Therapy have provided further support. Castle Manor Academy will provide assistants and marshals, with others coming from community groups in the town. Members of Haverhill Running Club will also likely be involved, including chairman Trevor Bunch acting as an adjudicator. On Tuesday Haverhill Town Council will decide whether they will support the race. The events will begin at 9.30am, with both routes heading along Recreation Road and Helions Park Avenue and then through the town centre and along Withersfield Road, with roads closed for the beginning. The 13.1-mile half-marathon route will travel through Withersfield to Great Wratting, back to Haverhill on the railway line to Sturmer and then around the golf club and through the Chalkstone estate before finishing. The 10k (6.2 miles) will turn down Howe Road and down the railway line and head back through Sturmer to the town. All finishers will get a medal and goody bag. Race director Jack Tappin said: “Haverhill already has a vibrant athletics scene and it’s a shame the town doesn’t have its own race when neighbouring towns do, so hopefully this will act as a flagship run and become an annual event. “I’m hoping this inaugural event will attract seasoned runners as well as those looking for a step up having completed 5k fun runs such as the Race For Life. “I also hope lots of people will turn out to cheer on the runners as they head through the town centre at the beginning and indeed throughout the course. Matthew Hancock MP, who will set off the 10k, said: “The event will unite the community, bringing together people of all ages and abilities, as well as being an enjoyable day out for the whole of Haverhill. The half-marathon will be set off by Haverhill town mayor Cllr Roger André who said: “It’s great to have a public event coming to Haverhill and will continue to put the town on the map following the success of the Olympic Torch. Sanofi is the event’s main sponsor, and Steph Manning from the pharmaceutical firm’s community relations team, said: "The community relations team at Sanofi Haverhill supports Sanofi in regards to their corporate social responsibility and aim to become the ‘Neighbour of Choice’ for our local community. "St Nicholas Hospice Care has been a Sanofi Haverhill site chosen charity for many years and we recognise the vital work the charity does in our community. 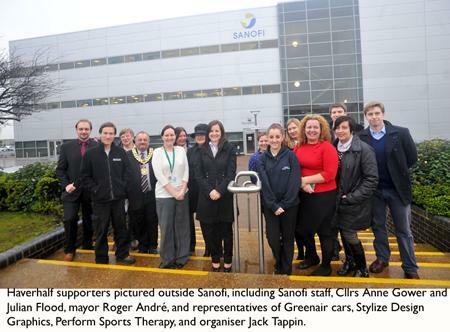 "Sanofi is delighted and proud to be able to support them in their forthcoming event and for 2014." Jordan Hughes, community fund raiser for the hospice, added: “As it’s our 30th anniversary it’s a fitting tribute for Haverhill to have it’s first half-marathon, particularly as it involves the entire community and will be using our new outreach centre. All three of Haverhill's county councillors have provided cash for the event from their locality funds. Cllr Tony Brown for Haverhill East and Kedington, described the race as ‘a very good thing for the town’. Andy Barrat, team leader for PE at Castle Manor, said: "Castle Manor Academy sports leaders support many events throughout the year for competitors from Haverhill and beyond. "We are very excited about being able to support this new event and use their energy and expertise. It's a privilege for us to be a central part of these community events." Stylize will be making the signs for the race and providing the runner numbers. Greenair cars will provide a support car on the day and water on the event. Katie Ditchman from Perform Sports Therapy, who has helped out with events such as the London Marathon and Ride London, will be providing massages for weary runners after the race. An application has been filed for a licence for the event to be an official UK Athletics registered race, and the routes will also be officially measured. Entry is £16 for the HaverHalf (£14 for affiliated club runners) and £12 for the Haver10 (£10 affiliated), with costs rising by £2 on the day. Entry is free if £100 in sponsorship is raised – you pay to enter then submit the amount raised minus the entry fee already paid. 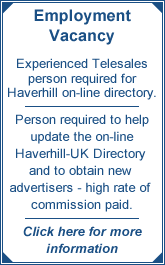 Application and sponsor forms can also be collected at Haverhill Arts Centre and at Sanofi reception in Rookwood Way, or by e-mailing jack.tappin@gmail.com, which is also the address to use to register your interest in volunteering. Parking will be at nearby Cleales car park and Haverhill Library, with the Burton Centre being used as a base as it will by then be operating as an outreach centre for the hospice.